This is a large hydroelectric dam surrounded by primary and regenerating lowland forest. It is an hour drive from the state capital and about 5 hours from Kuala Lumpur. It is believed that the area is the habitat of more than 8000 species of flowers, 2500 species of plants and trees, 8000 species of orchids, 300 species of fresh water fish and about 350 species of birds. Birdwatchers usually get the best bird records via roadside and lakeside birding along quiet roads especially the Waterfall Road which is a dead ended road and hence secluded and mainly unused. 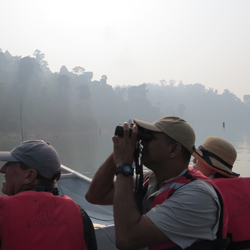 The highway (T156) that leads from the main Jetty (Pengkalan Gawi) on towards Gua Musang is a stretch of beautiful hilly terrain with many opportunistic birding stops and landscape views. A total of 9 out 10 Malaysian hornbill species are regularly recorded. Wrinkled Hornbill is regarded by some as the rarer of the local hornbills and this is the best place to record it. Lesser Fish-Eagle, Large Green Pigeon, Blue-banded Kingfisher, Wallace’s Hawk-Eagle, Straw-headed Bulbul, Bat Hawk, Red-bearded Bee-eater, Great Slaty Woodpecker, Pale Blue Flycatcher, Great Iora, Green Iora, Red-throated Barbet, Wrinkled Hornbill, White-crowned Hornbill, Wreathed Hornbill, Black Hornbill, Oriental Pied Hornbill, Rhinoceros Hornbill, Great Hornbill, Helmeted Hornbill. The Setiu Wetlands is a part of the Setiu river basin, in the large Setiu-Chalok-Bari-Merang basin wetland complex. 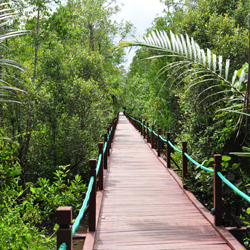 Situated about 60km north of Terengganu, it is listed as an important wetlands area in the Malaysian Wetlands Directory. The wetlands cover an area of about 23,000 ha, between Kampung Raja in the north and Batu Rakit in the south. Habitats here are diverse, consisting of a unique riverine forest, melaleuca swamp forest, peat swamp forest, brackish water lagoons with vegetated sand islands, mangrove forest, sea grass beds and sandy beaches. Although it is not well-known as a birdwatching site, this wetlands has rich diversity with a reputed 160 species. Lesser Adjutant Stork, Malaysian Plover, Black Hornbill, Rhinoceros Hornbill.